These are the packages Magic Paul has found work best for him. If you would want something different, please let Magic Paul know and he’ll create a Bespoke Party Package especially for you. Recommended for children aged between 3 and 10. Parents of children aged between 9 and 15 may also wish to consider Paul’s Young Adult Parties. 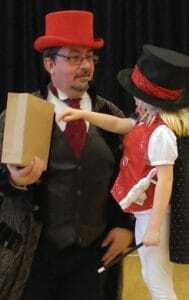 An amazing, funny and engaging magical experience for your children and their friends. A guest planner to help organise attendees, presents, thank yous, etc. A Party Hints and Tips sheet built from years of experience to help you plan the best party possible! Optional: Professionally Printed Invitations with all the party details already on, for you to use. See the “Optional Extras” section for details. Optional: A balloon model for each child. See the “Optional Extras” section for details. Optional: Party bags filled with 6 amazing toys and fun items. See Optional Extras section below for more details. Optional: Party bags filled with 6 amazing toys and fun items. See the Optional Extras section below for more info. All you need to is book the venue, invite the guests and provide the food. Magic Paul will do the rest! Items in bold are exclusive to the 2 hour package. Prize giving ceremony with prizes (including options for all dietary requirements) for everyone. A gap in proceedings for food. Want to make the party that little bit more special? 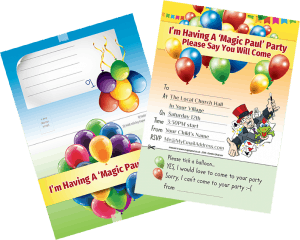 Professionally Printed Invitations with all the party details already on, for you to use. These are good quality party invitations, complete with all party details. All you need do is write who they’re for and them give them out. A balloon model for each child. Each child at the party will receive a balloon model. These are made before the party and brought along on the day so valuable party time is not wasted in making them. 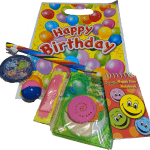 Party bags filled with 6 amazing toys and fun items. A notepad, a special magic pencil which changes colour every time you write with it, a mega bouncy ball, a puzzle/game, a musical instrument/noise maker (sorry!) and a pattern maker (I used to call them a spirograph) to bring the artist out! For just £1 for each child, you get a professionally printed invitation AND a balloon model per child, delivered on the day. The Birthday child (or children) gets a special balloon model, bigger and better than the others! Separately, the invitations are 50p each and balloons are 75p each. 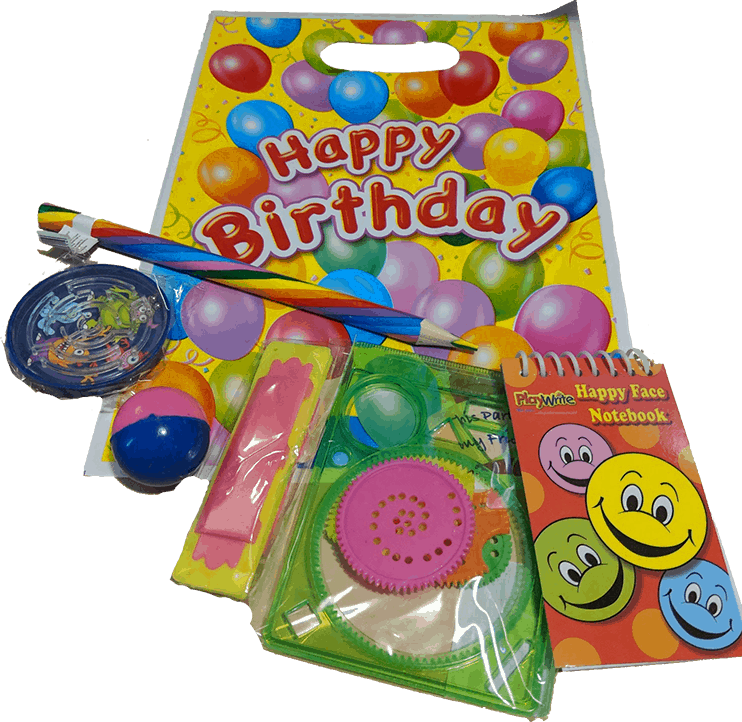 Party bags are just £2.50 a bag and you only pay for those you use on the day. Separately, invitations are 50p each and balloons are 75p each. He doesn’t need much, but these would help. A performing area. This can be a front room, or a full stage. If the space is too small, Magic Paul may not bring along his full stage set or sound system. An audience area. Just somewhere for the children to sit where they can see the show. A power socket for the sound system. Magic Paul has PAT certificates for everything he uses and can even work without a power socket sometimes, if given enough notice. A ceiling and walls. The really show works best indoors. It can be performed outdoors but Magic Paul cannot hold to his guarantee for outdoors performances. Other distractions to be removed. 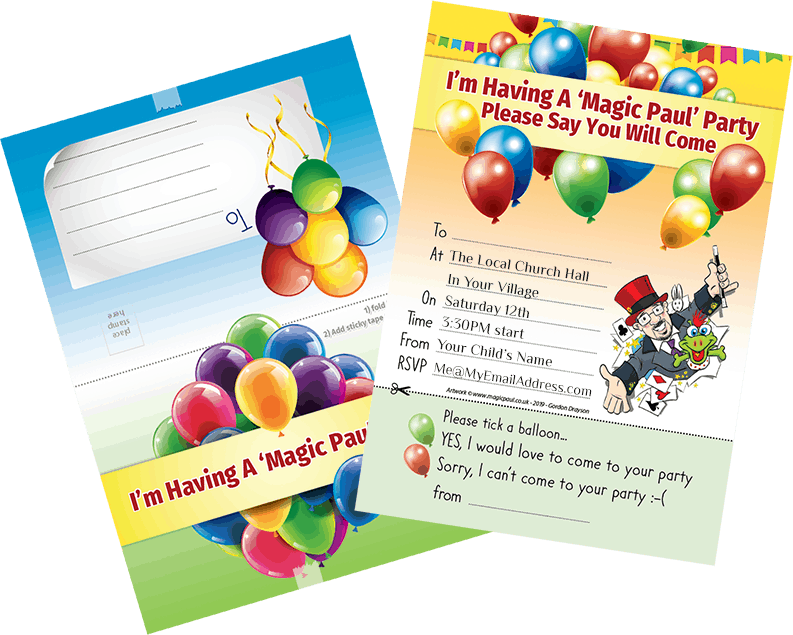 Yes, Magic Paul can hold the attention of his audience for a whole party so you can save money on that bouncy castle and you can forget those floor balloons!